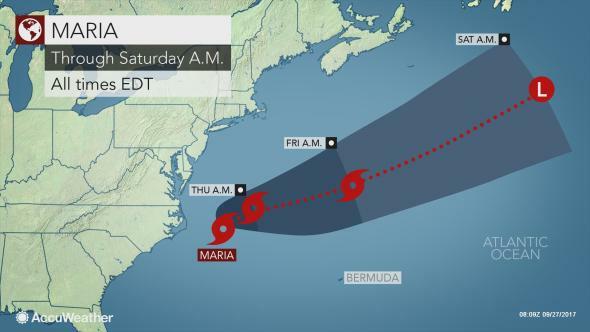 Maria is making its closest approach to North Carolina with gusty winds, beach erosion and coastal flooding on Wednesday, while dangerous seas elsewhere along the East Coast at midweek. The eye of Maria will be between 140 and 150 miles east of the Outer Banks on Wednesday. Thus, the core of the storm with the strongest winds will stay offshore. Maria was downgraded to a tropical storm on Tuesday evening, then regained Category 1 hurricane status on Wednesday midday. 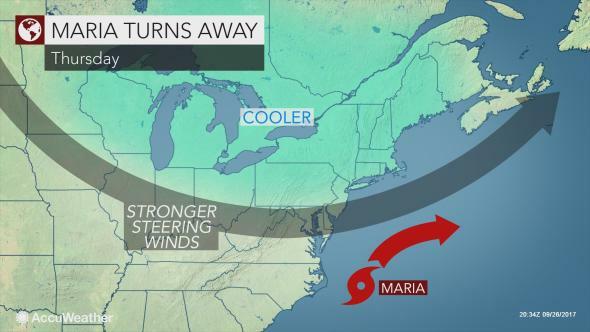 "We expect Maria to bring tropical storm conditions, or the equivalent of a moderate nor'easter, in part of eastern North Carolina and in southeastern Virginia," according to AccuWeather Senior Meteorologist Alex Sosnowski. Maria moved into an area of weak steering winds off the Carolina coast. Maria's forward progress has diminished, but will soon increase as a push of much cooler air sweeps in from the west. The slow forward motion will produce moderate coastal flooding and significant beach erosion along the Outer Banks and southeastern Virginia coast into Wednesday night. The worst conditions will be near and north of the center of the storm, from eastern North Carolina to Delaware. "A coastal inundation of 2-4 feet is likely on the barrier islands of eastern North Carolina," according to AccuWeather Hurricane Expert Dan Kottlowski. The worst conditions will be around the times of high tide. The impending effects from Maria forced mandatory evacuations of visitors in Ocracoke Island and Hatteras Island as well as the closure of the Ocracoke Campground. "Waters are likely to rise to about 2 feet above astronomical tide levels in southeastern Virginia, with minor coastal flooding likely," Kottlowski said. While a few bouts of showers will graze the Outer Banks of North Carolina through Wednesday, the heaviest rain will remain well offshore. Any showers are not expected to exacerbate coastal flooding. 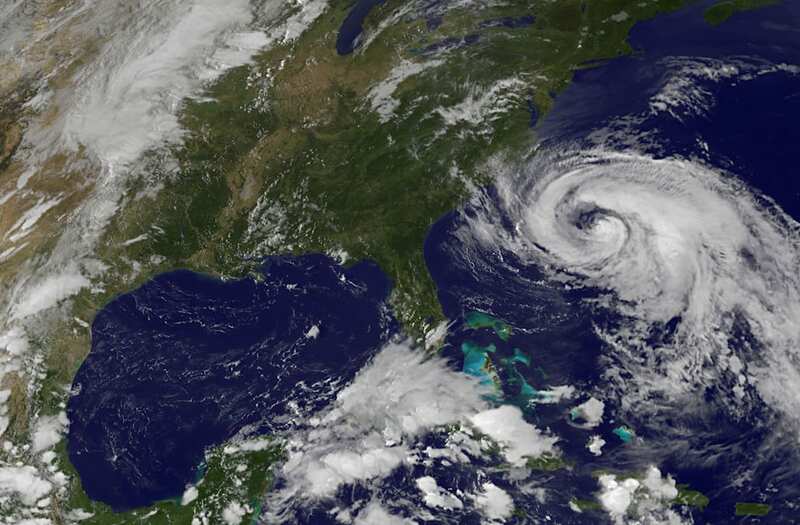 Tropical storm-force wind gusts of 40 to 50 mph can lead to minor property damage and power outages for parts of the Outer Banks, especially Cape Hatteras, according to AccuWeather Senior Meteorologist Frank Strait. Loose outdoor items should be brought inside to prevent them from being tossed around in the wind and becoming dangerous projectiles. Weak tree limbs could be snapped. As the sweep of cool air arrives, Maria will accelerate northeastward and out into the open Atlantic Wednesday night and Thursday. Summer-like heat spanning the eastern third of the nation will come to an end. 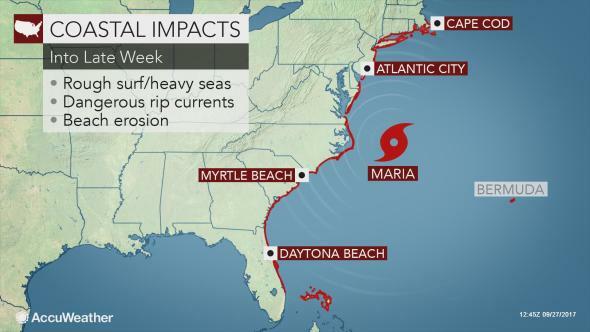 Even after Maria’s closest approach to the East Coast, seas, surf and rip currents will be a problem from the northern Bahamas and Florida, to the southeastern New England beaches this week. Lifeguards reported 25 water rescues because of rip currents at Wrightsville beach, North Carolina, on Saturday. Near Jacksonville, water rose up to the dune line at South Ponte Vedra Beach, Florida. While air and water temperatures are sufficiently high for swimming along the Atlantic Seaboard, those heading to the beach should avoid going into the water. Getting caught in a rip current is a life-threatening situation, especially during a time of year when lifeguards are not regularly on duty. "People should avoid standing on jetties, due to the risk of sneaker waves," Sosnowski said. 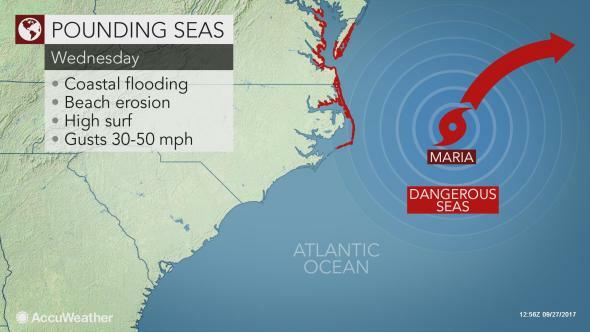 "Small craft should remain within the protection of intercoastal waterways this week and should remain in port through Wednesday night from North Carolina to southeastern Virginia." As the storm tracks into the North Atlantic at the end of September, some of Maria’s rain and wind could brush part of Atlantic Canada. At the very least, seas near the coast and offshore will become dangerous. A lull in tropical activity will follow Maria, but there will likely be more tropical threats heading into October. The Caribbean Sea, Gulf of Mexico and U.S. near-shore areas of the Atlantic will be places to watch closely.